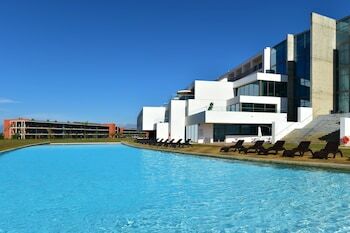 Located in Portimao, Pestana Algarve Race Hotel & Resort is a 5-minute drive from International Kart Circuit and 5 minutes from Algarve International Autodrome Raceway. Featured amenities include a 24-hour front desk and laundry facilities. Planning an event in Portimao? This hotel has 4736 square feet (440 square meters) of space consisting of conference space and a meeting room. Free self parking is available onsite. With a stay at Casa Petrus Guterri in Fundao, you'll be within a 15-minute drive of New Castle and Archaeological Museum of Fundao. Free self parking is available onsite. Located in Guarda, Residencial Ferrinho is within a 15-minute walk of Guarda Cathedral and Museu da Guarda. Free self parking is available onsite. ShortStayFlat Estrela S.Bento offers accommodations throughout the area in Lisbon.